This Habersham Village eatery marks one more delicious success for Brian and Jennifer Husky of Gaslight Group, the jaunt responsible for Blowin' Smoke, Abe's on Lincoln, B. Matthews and Blue Turtle Bistro. It's their fifth concept, fifth venture, a fifth notch in the belt for indie restaurateuring — no small feat in a fair-weather tourist town where restaurants and bars weed in and weed out with the changing of the seasons. "It takes a lot of courage to put yourself out there, especially in the economy that we're in," says chef and general manager Chris Wise, who serves up 20-plus years of culinary expertise. "The owners are absolutely wonderful to work with ... very hands on." For a midtown destination, 5 Spot pulls in its fair share of tourists, hungry for a casual space with plenty of parking, a handful of silent TVs and a smattering of outdoor tables. The vibe is familiar, relaxed and comfortable. "I see enough of the people who come in everyday to know that we have a pretty good local following, very loyal, great customers," Wise says. "They bring a lot of energy to this place." The draw is the solid reputation of an outfit known for quality cuisine and for giving the people what they want. 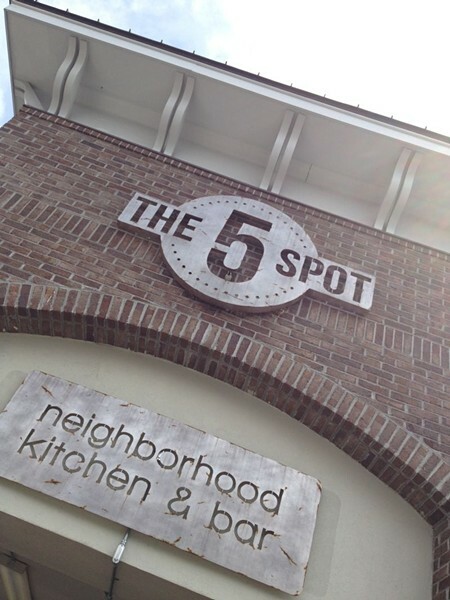 The specific 5 Spot slant is straight-up accessible, American fare, nothing excessively pre-packaged, but rather more down-home, Lowcountry neighborhood fare. "We're trying to be an American bistro ... trying to blend new with old. It's a lot of the kind of food that you saw growing up, but with a twist." Crowd-pleasers includes the grilled salmon entrée with a burnt rosemary aromatic, the fried green tomato BLT, the Cuban, the Reuben and their signature peach barbecue sauce on the pulled pork sandwich. A new addition to their summer menu: chicken and waffles with a red-eye gravy. You don't have to be downtown to enjoy cutting edge, super-tasty farm-to-table type cuisine with a cool bar. Great food and great timing — there really wasn't a place quite like it in town when it opened in 2010 — equaled a success story on the fringe of Baldwin Park. Now folks from all around come here to wait in line — and it's quite worth it. There is a handful or less of establishments in Savannah that can truly make the claim to be just as popular with locals as with tourists. The Olde Pink House fits that bill, frequented by brunching churchgoers and eager Ohioans alike, many of whom enjoy the signature Shrimp & Grits, always a competitive dish in Savannah and the Lowcountry. The cool bar renovation is a master added touch, and the service is friendly and top-notch. If you're downtown with a passel of hungry young'uns and you're trying to figure out where to take everybody to make everyone happy, just walk into B&D, either on Broughton or their new Congress Street location. This has been a breakout year for the little South African takeout joint that could, with national press and a new location planned for the old Isaac's on Drayton location. Often referred to simply as "Shalom Y'all," the annual Jewish Food Festival fills the senses with the tastes and aromas of classics like matzoh ball soup, blintzes and challah. The Fest celebrates its 25th edition this October. Roberto and his place haven't been in town long — by Savannah standards — but they've taken the place by storm like tiramisu from heaven. A boisterous atmosphere combines with succulent Italian faves like Tagliatelle Carbonara and a delightful seafood risotto, with most all the pasta made fresh on site. One of the few Southside spots that really has a devoted citywide following, Tangerine is the place to go for sushi, and perhaps oddly, super good dessert. Don't be fooled: You'll get great pizza here, no doubt, but it's actually an awesome Greek diner, with authentic takes on Hellenic favorites. The gyro pizza is to die for. Service is friendly and generous on the refills, and the beer list is great too. As if you're on the edge of the world, this rambling seaside shack offers some of the tastiest Caribbean style eats this side of, well, the Caribbean. It's technically a regional chain, based in Texas, but you wouldn't know it from the extraordinary attention to service and detail and the creative menu options for the various, largely freshly-made dishes. Did someone say fish 'n' chips? Bangers 'n' mash? Scottish meatloaf? Get it all here along with dozens and dozens of different single malt Scotches. This perennially popular party spot packs 'em in at five locations now, including Richmond Hill and Effingham County. This popular River Street spot was originally called the Olympic Cafe until the actual Olympics came to town in 1996 and told them to change their name. Olympia gets the last laugh though — Savannah remembers them a lot more (and more fondly) than the '96 games. Delectable Cuban dishes, superb mojitos from the full bar, futból on the TV, and the occasional Flamenco show. What's not to love? This Southside staple is where to go for curry, stir fry and especially awesome seafood dishes. Come pho the pho, stay pho the phun. Take a tasty walk downstairs to this popular hangout for gourmet finger foods as well as craft cocktails and live tunes. One of the great Savannah success stories over the past year, the Market has grown leaps and bounds. With fresh local organice produce and poultry, Saturday mornings and early afternoons have become a staple of many a Savannahian's week. Perfectly situated in the heart of Savannah's wee-hours entertainment district, people from all walks of life get a slice here at all times of the day. Not only a carnivore's dream, but a recent renovation has brought a swank nightspot to the interior as well. Tantalizingly tasty Southern/Soul Food at this Eastside neighborhood spot. The global domicile of flapjacks. Fun, airy place in a restored auto garage turns out to be a great place to take the whole family for an awesome breakfast or brunch. It's a fairly new tradition in a town which takes its traditions seriously. Patties made to order, reasonable price, fun atmosphere, free peanuts. Makes ya want to buy two or three. A staple of the lunchtime crowd downtown just off busy Broughton Street, Roly Poly deals a mean range of wraps, from the Monte Cristo to the Chipotle Steak. A true Savannah original, most everything Angel's does is distinctive, from the variety of adventurous sauces to the delicious, non-mainstream sides. The legendary Savannah communal eating spot still holds the title in Savannah and easily competes as best fried chicken in all the South. Fresh ingredients and a sharply dressed sandwich are hallmarks of this quick, popular spot downtown that delivers by bike. Several signature sauces make those wings extra delectable in this popular City Market spot. These mouthwatering, fall-off-the-bone babies are always worth the jaunt to Whitemarsh Island. A new winner in this category, Jennifer Jenkins' labor of love has helped rejuvenate the Thomas Square neighborhood with a delightful blend of strong java, freshly made Tex-Mex specialties and live music. Two words, people: RAPTURE SUNDAE. Newly-appointed kitchen manager Natasha Gaskill has also brought a bevy of new baked treats to the bar. Dedication to freshness and an adventurous spirit combine for this nationally-renowned, delicacy-driven business in the Starland District. Gotta be the South's favorite ice cream store. No other way to look at it. Holding down the Southside with WAFFLE CONE WEDNESDAYS. One of Savannah's truly great food treasures, this unassuming but extremely popular Southside location has served the best bagels and deli food for years to an adoring fan base. One of the all-time perennial winners in the history of our Readers Poll, the Crab Shack continues to be the epitome of the Savannah/Lowcountry fresh seafood experience. Thank goodness Paula Deen is still helping to bring tourists to town. From Greek to West Indian curried chicken to Spinach & Wild Shrimp, Kayak has a vast range of super-fresh salads to munch on while you peoplewatch. One of the pioneer businesses to spearhead downtown Savannah's renaissance — not to mention one of City Market's oldest and most respected anchor institutions — Vinnie's also maintains high standards for really awesome pizza. Behind this unassuming storefront on Broughton is the home of some authentic Continental cuisine in a tightly focused menu. Don't forget brunch Saturday and Sunday! Airy, friendly spot to enjoy sushi and tasty hibachi dinners. Yoshi & Co. are still the masters of the ancient edible Japanese art. Mall Boulevard is the home of the most delectable delights from the subcontinent. Still pretty sure no one else has ever won this category in all the years we›ve held the Best of Savannah Readers Poll. Without doubt the best gyro and falafel for miles around, in a friendly, informal atmosphere at very reasonable prices. Just go already! This very new spot is quarterbacked by Chef David Rowland, who's cooked up some good grub at the famous Grove Park Inn in Asheville, where the first location of Vegheads lives. A wonderful old Savannah family institution, with a third generation of Russos helping serve the freshest wild shrimp, scallops, and fish to generations of satisfied customers.